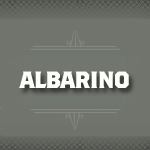 Albarino is a white wine grape grown in northwest Spain and northwest Portugal. Sometimes known as Alvarinho and Cainho Branco, it is used to make assorted varietal white wines. The grape is known for its botanical aroma similar to that of Viognier and Gewurtzraminer. Not to be confused with Alvarinho Lilaz the wine produced is unusually light in color and high in acidity and alcohol content.